Just the other night my husband and I were reflecting on reaching the two year mark with Six Figures Under. It’s pretty crazy to think that I have been sharing the ins and outs of our finances with the world for two years now! Honestly it doesn’t seem like it has been that long. At the same time it feels like it’s been forever. I can’t remember what I did in the evening back in the days before blogging. While I usually don’t blog about blogging, I think that sticking with something for two years is worth celebrating! To make the celebration more exciting, I have a fantastic giveaway! Feel free to scroll past my nostalgic reflections to get to the excitement. I’m not sure of the official date I should celebrate, so I decided to go with a blogiversary season, instead of a date. Two years ago in September I bought my domain name and starting writing SixFiguresUnder.com. It was October before I had enough posts up that I felt comfortable inviting any visitors. I had actually planned to wait a little longer before going public, but one of the big blogs I follow had an article about paying off student debt. I couldn’t keep quiet, as paying off student debt is the premise of this blog. I shared my two cents (probably more like ten cents) in a thoughtful comment on the topic, and just like that readers started showing up! That comment became my unofficial official blog launch. 2- Can I Really Make Money on Etsy? 1- Can You Freeze That? Thinking about a blog? Just start! I had been reading blogs for a decade before starting this one. I had toyed with the idea in the past, but always feared that I was already too late in the game. Seasoned bloggers had archives full of amazing posts (which were cleverly cross references in current posts). How could I ever catch up? The truth was I didn’t have to. It’s not a contest. There’s no winner. I finally started my blog for five reasons, none of which involved competing with anyone. Slowly but surely, I built my own archives of awesome posts. You can do it too! Don’t let comparison deter you from getting started. I spent very little to get my blog up and running. I can even show you a step-by-step tutorial for setting up a self-hosted WordPress blog (the best kind if you plan to ever earn anything from your blogging). I wish all of my awesome readers could win a KitchenAid, but that’s just not in the budget! The good news is that if you don’t win, there’s still something for you! Mark from Bare Budget Guy is offering my readers a way to get great prices on new, name-brand appliances. The first 100 to sign up will get instant web access to insider deals on everything from toasters and blenders to refrigerators and washing machines. If you are in the market for large or small appliances (or something in between), then you’ll definitely want to check out the special, direct-from-manufacturer prices on brands such as KitchenAid, Maytag, and Whirlpool. It’s great for some holiday shopping or filling a need at home. Enough of my reminiscing. Let’s get to the good stuff! I have partnered with Mark from Bare Budget Guy to bring you an awesome giveaway! One lucky winner will receive a KitchenAid® Artisan® Series 5-Quart Tilt-Head Stand Mixer! My favorite part is that you can choose your own color! You can get it to match your kitchen or surprise your mom with her favorite color. For those not versed in KitchenAid, a 5-quart bowl has the capacity for 4 loaves of bread, 9 dozen cookies, or 7 pounds of mashed potatoes. It comes with the pouring shield, dough hook, flat beater, and wire whip. Between baking bread, making cookies, and shredding chicken, I use my KitchenAid daily. It’s definitely my most-used kitchen appliance. Oh, and that wire whip makes excellent meringue. I know you’ll put this baby to good use too! The giveaway will run through midnight (Pacific Time) on Monday Nov 2nd. I will email the winner who will have 48 hours to respond. I’ll announce the winner in my weekly newsletter on Nov 7th. Good luck to everyone! After you enter, be sure to go take a peek at the insider deals on appliances! Congrats on the anniversary! I must have found your blog near the beginning, because I’ve been following you for over a year and a half now. I look forward to your new posts, especially your debt repayment ones. In fact, you helped inspire me to start my own blog. So, thanks! Thanks Sarah! I’m glad you found me in the beginning and have stuck around! Your blog looks great too, by the way! Heck yes. I just made the maximum of entries 🙂 Congratulations on your 2-year anniversary! I’m in awe of how much you’ve done and how far you’ve brought this blog while handling three-now-four tiny children. Love following your journey. I’m dying to know- how do you shred chicken in a stand mixer??? You can shred boneless chicken in the mixer. I usually cook mine by boiling or stove stop. I place the really warm to hot chicken in the mixer with the paddle mixing piece and let it go at a speed of 2-3. It makes perfectly shredded chicken in less than a minute. Yep! Thanks for chiming in Kim! That’s how I shred chicken too! I found your blog about a year ago when we were looking for ways to reduce our cell phone bills. I found your post reviewing Republic Wireless. My husband has been using RW for about a year now, having signed up using your code, and is very pleased. Thanks! Congratulations on 2 years – your blog is amazing, and I can’t believe you’ve built it up so well in such a short amount of time. I know there will be a lot of entries, but would love to win one of these as I have a smaller mixer and like to make multiple batches of bread. Thanks for hosting this! Thanks Kathryn! I’m happy to hear that your husband likes creamy tacos! I was really surprised at how that post took off. I shared it because it is the epitome of comfort food and it’s one of our favorites, but the pictures aren’t great, so I didn’t think it would hold up to all the “food art” on Pinterest. Even with pics that are just so-so it gets lots of traffic! Wow! Two years already. I have learned so much from your blog. I have always wished for a stand mixer like this! Stephanie, congratulations to you and your family on your 2 year blogiversary and debtfree journey progress! Your blog has been an inspiration for us. My husband signed up for Republic Wireless after reading about your experience and he’s been totally pleased with the experience and we love the savings – more money to pay down our debt! We love the zucchini brownie recipe you shared – yum-yum-yummy! And we look forward to reading your monthly debt progress reports – very exciting to watch your debt number dropping every month! And I’d love to be entered into the drawing for the KitchenAid stand mixer! Thank you! Thanks for sharing Midori! I enjoy hearing what people’s favorite posts are. Thanks for the encouragement on our debt journey! Congrats on 2 years! Your posts have been an inspiration to me and have often made me think and rethink the way we do things. We are using YNAB now thanks to you! Thanks for the giveaway too. Wow, COLORS! Drool. Hooray! YNAB is great! Thanks for the kind words Amber! Love reading your blog. We are still paying off debt. Easy to get into, hard to get out of. How do we sign up for the giveaway? I did the email log in but don’t see another thing about the giveaway. Wow… your blog has it all. I have basically been stalking your site for three weeks 🙂 You have been a fantastic resource for me (introducing me to living on last month, YNAB, RW, etc). 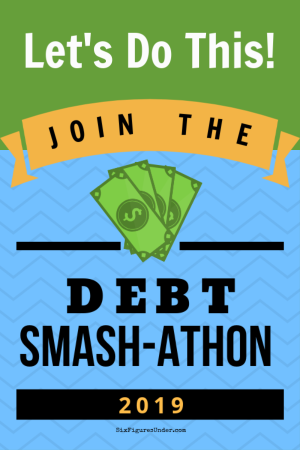 I am so excited to start 2016 with a debt free slate! You are an inspiration to us all and the fact you have only been blogging for 2 years!! Congrats!